The other week (it truly has been weeks since I've cooked dinner for us... maybe tonight! ), we needed a side to accompany the steaks Andy was making for dinner. Potatoes were on my mind but mashed potatoes or baked potatoes weren't doing it for me. I love scalloped potatoes but didn't have the time or patience to do that. 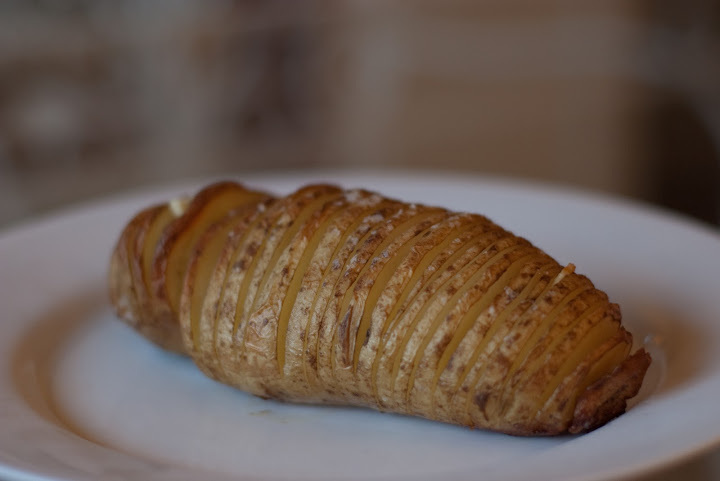 Then I remembered a picture from my friend Joanna's pinterest board of Hasselback Potatoes. Not quite a baked potato, not quite roasted potatoes but perfectly delicious. These were tasty, different, easy and hands off. Would be perfect for a dinner party as they are quite pretty. Don't skip the garlic. That was key to making these have a little edge. Preheat the oven to 425. Slice the potatoes into thin slices but not all the way through. You want the potato to stay in one piece. Stick slices of garlic in between the potato slices and smear a little butter in there as well. Season liberally with salt and pepper. 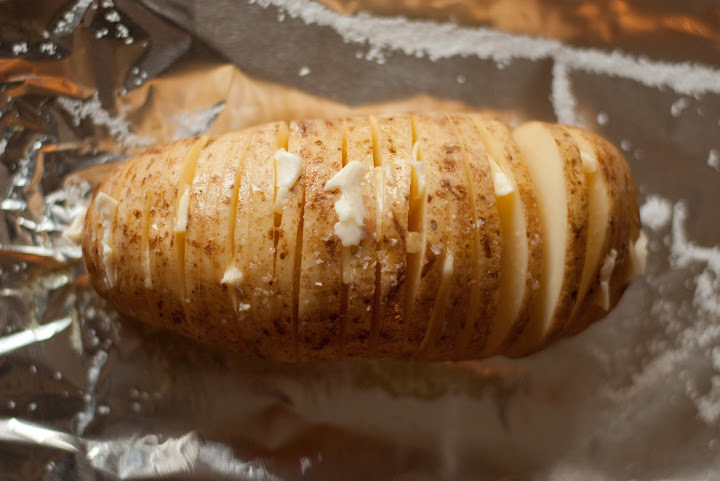 Bake for 45 minutes to an hour or until the potatoes are brown and crispy on the outside but soft and tender in the middle. It took me closer to an hour and I think it could have cooked longer.